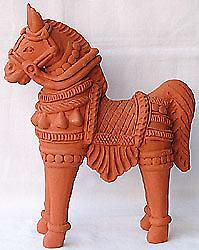 Among the clay products of Uttar Pradesh, pottery of Gorakpur is very famous. The potters of this region make animal figures like horses and elephants with hand-appliqu?d ornamentation. Figures of goddesses moulded into lamps, mother and child motifs as well as other ritual objects are all crafted here by hand.